Wan Ahmad Najmuddin Mohd (2nd from left), with senior Australian police officers, after his appointment as the CID chief last year. (PDRM pic). 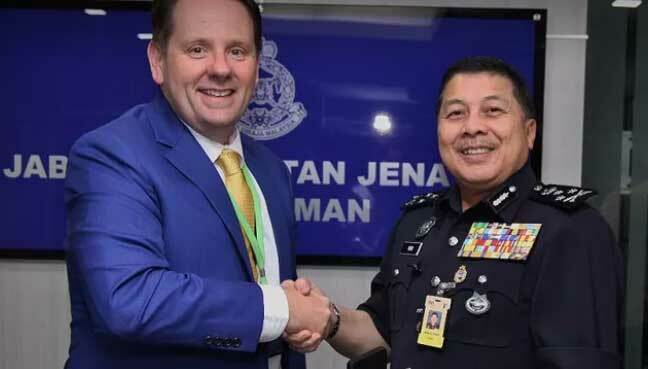 PETALING JAYA: Australian authorities have frozen close to RM1 million in a bank account belonging to Criminal Investigation Department (CID) director Wan Ahmad Najmuddin Mohd, according to a special report by Sydney Morning Herald (SMH) today. The Enforcement Agency Integrity Commission (EAIC) might not have the “teeth” to prosecute those who have abused detainees or who caused the deaths of those in custody. However, despite its lack of prosecution powers, the EAIC has done some excellent work in recommending actions to be taken against police officials who have abused their power and those who have engaged in serious misconduct. Whether the government will act on the recommendations to check or discipline members of the police force guilty of abusing power remains to be seen. However, if the past is any indication of what is to come, the government might have little political interest in disciplining members of the police force. Given this situation, the setting up of an Independent Police Conduct and Misconduct Commission (IPCMC) cannot be delayed any further. The EAIC needs to be complemented by an agency that has independent powers of prosecution. BREACH of conduct and power abuse by police are what caused the death of detainee S. Balamurugan last year, said the Enforcement Agency Integrity Commission (EAIC). It was reported that EAIC chief A. Aziz A. Rahim said police had failed to heed the magistrates’ court’s order to immediately hospitalise Balamurugan. “The commission finds that police’s failure to release the deceased after their remand order was rejected by the magistrate is a serious misconduct,” Aziz told reporters in Putrajaya. Lawyer Eric Paulsen claims that M. Thanaseelan died because the police didn’t allow him medical treatment while in custody. – The Malaysian Insider file pic, July 1, 2015. KUALA LUMPUR, Feb 27 — Selangor police could have prevented the custodial death of M. Thanaseelan if they had followed lock-up rules and provided him with necessary medical treatment, lawyers for his family said today. According to Eric Paulsen and Melissa Sasidaran, the 43-year-old man had died of a “perforated gastric ulcer” last Saturday while under custody of the Bukit Sentosa police in Hulu Selangor. The lawyers cited from a post-mortem report which noted the deceased had a history of chronic gastritis and would have shown symptoms of the condition for at least a week prior to death. “It is clear from the lockup rules the police must care for the wellbeing of all detainees including informing the medical authorities of any illnesses or injuries affecting detainees. KUALA LUMPUR, Feb 26 — Following the death of yet another detainee in police custody today, a lawyers group alleged the authorities have done little to improve its procedures to prevent detainees from dying in lockups. Lawyers for Liberty (LFL) director Eric Paulsen claimed the lack of prosecution or conviction in past custodial death cases proved that the authorities are not serious in wanting to tackle the problem. “At the root cause of deaths in custody is the lack of seriousness of PDRM and the government in tackling custodial deaths,” Paulsen told Malay Mail Online.